Low prices. OrangeSmile.com offers car hire service in Cyprus on the lowest-rate-guarantee basis, since we work with car suppliers directly. For your search criteria in Cyprus, we always select and show the best rental offers. The car reservation process consists of 3 simple steps: (1) search for available cars for your dates in Cyprus; (2) select your car type; and (3) fill in the booking forms. Once the reservation is completed, you will receive a confirmation voucher to your email address. During the booking process, please check your rental conditions. To pick up your car at the rental point in Cyprus, you need to provide our confirmation voucher, your driving license and a valid credit card. The final payment is normally carried out at the pick-up point. Our car hire points in Cyprus accept VISA, MasterCard, etc - please check your rental conditions. At the pick-up point, please read the handling manual and check the car for present defects. OrangeSmile.com wishes you a pleasant journey to Cyprus! The car hire reservation system OrangeSmile.com allows renting a vehicle in Cyprus within 10 minutes. Our largest database of car suppliers enables us to provide you a rental car in Cyprus at the cheapest rate ever possible. At rental locations in Cyprus we offer the following car sizes: mini, compact, economy, standard, premium and luxury. The following car types are available in Cyprus: Sedan, Hatchback, Jeep, Cabriolet, Coupe, Minivan and Minibus. Travellers will find many interesting things to do in Cyprus. Beautiful nature parks, ancient shrines, magnificent amphitheatres and numerous monuments will only add to overall delight from visiting this popular resort. Akamas Nature Park, which is located not far away from Paphos, is one of the most famous landmarks of the island. The park is internationally famous because of Baths of Aphrodite – a big complex of pools with crystal clean water. According to a legend, the water in these pools has a mysterious healing power, so those who swim in it become healthy and beautiful for many years. However, swimming is prohibited in Baths of Aphrodite, but witty tourists take small bottles with them and then fill these bottles with the magic elixir of life. The ancient city of Kourion is an internationally famous destination. The city is located on a high cliff. Kourion was founded more than three thousand years ago. According to one theory, the city was founded by Greek warriors who participated in the Trojan War. That happened in 12th century B.C. ; the city was developing during almost 16 centuries, until it was destroyed by a devastating earthquake in the 4th century. The Sanctuary of Apollo Hylates, which dates back to the 7th century B.C., is one more archaeological landmark. The sanctuary is located not far away from Kourion ruins. The construction was severely damaged and only the gates and steps that once led to the altar have survived. There are many beautiful legends connected with the sanctuary. For example, it was considered that only the bravest and most honest people can climb all the steps and reach the altar. There are also buildings of the medieval period on the island, such as Kolossi Castle that was built in the 15th century. The height of one of its towers is 25 metres. 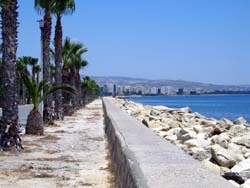 The observation deck installed on that tower features amazing views of the coast and the nearby city of Limassol. There is an old cypress tree in the yard near the castle. The centuries old tree fascinates visitors with its size and huge branches. Kikkos Monastery is considered the most beautiful landmark of its type on the island. The monastery was built in the 12th century. The history of the monastery is interesting and unusual same time; it was assaulted many times until the monastery was completely plundered by Turkish conquerors in 1851. Another famous religious building, Stavrovouni Monastery, was built in the 4th century by order of mother of Emperor Constantine. The crucifixion, which was a gift of the empress, is the main artefact of the monastery. Kouklia is also a famous historic and archaeological centre in Cyprus. The village is known as the location of Aphrodite Sanctuary. There are also several ancient temples there and a big open air museum. In winter time or for mountain trips, it is recommended to order winter tires and/or snow chains. They will help to keep your safety on a high level and will eliminate limitations during your route planning in Cyprus. During your pick-up, ask the staff how critical the delays in vehicle return are. As a rule, in Cyprus a delay of up to one hour is not considered critical and does not incur penalties.